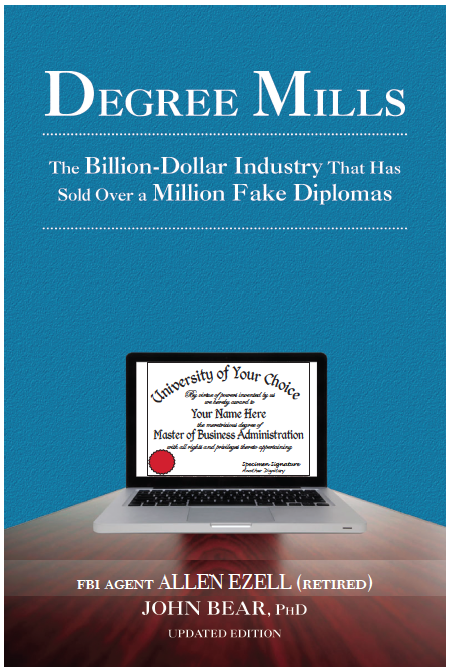 Welcome to the Internet home for the definitive book on degree mills, diploma mills, and fake academic credentials. A PERSONAL LETTER FROM THE AUTHORS, FBI SPECIAL AGENT ALLEN EZELL (ret'd) & JOHN BEAR, Ph.D.
• If you came here because you were searching for a fake degree to buy, we urge you to think again, and avoid the terrible risks of, as we say, "putting a time bomb in your resume." • If you came here to learn more about degree mills and fake credentials, our book is a great place to begin. You can learn a lot more about the book, and the field, on this site (see the list to the left). Anyone considering buying (or who is already using) a fake degree. Anyone who has identified someone else (friend, co-worker, boss, celebrity, etc.) who may be using a fake degree (or who wants to check up on people). Human Resources professionals and corporate executives who worry (or should worry) about the liability of employees with fake degrees. And anyone who enjoys reading stories about clever scams, frauds, and their perpetrators.